Have you added two dollars to your grocery bill to benefit a local charity? Decreased your power usage after being shown how much your neighbors were using? Had better aim when using a urinal with the image of a fly etched into the porcelain? If you answered yes, then consider yourself “Nudged.” And yes, the urinal approach is actually being used in Amsterdam’s Schiphol Airport restrooms. Attributed to Richard Thaler and Cass Sunstein in their best-selling book “Nudge: Improving Decisions about Health, Wealth, and Happiness,” a “Nudge” is a signal — which could be contextual or environmental versus written or verbal — that changes the behavior or decision that a human will make. The original test of this theory was in a Chicago school district where they changed how food was laid out in the school cafeteria. This had a 35 percent positive impact in the consumption of healthier foods, without actually restricting the overall choices of foods available. Leveraging a variety of different strategies, such as default settings, information as incentive and right context, companies have proven the ability to change someone’s behavior through a successful Nudge. So why do these Nudges work? Essentially, we don’t have time to process each decision that we make in life. Instead, we use cues and heuristics to guide our decisions — an automated decision making process. The basis of Nudge theory is to apply an understanding of predicted behaviors to shape and influence that automated process. 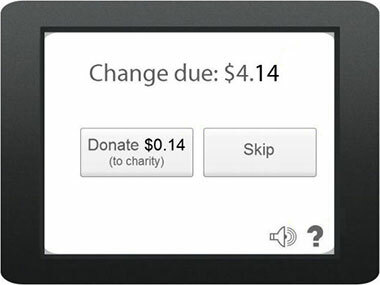 While standing in the checkout line, most shoppers will not weigh all of the pros and cons of donating two dollars to the charity at hand. The retailer can easily drive the results it wants by predicting that most shoppers will be in a hurry, and willing to accept the two dollar price point. Now let’s consider how many decisions are made by a mobile user each day. Should I use an app or a mobile site? Should I forward this to my friends? How much should I top up my prepaid account? Each individual’s decision is a unique, personalized Nudge opportunity. And herein lies the challenge of applying an understanding of predicted behaviors to the mobile space. Although the traditional Nudge approach, which leverages trial and error, has proven successful for influencing the masses, it does not allow for the creation of timely, individualized Nudges for millions of dynamic customers. So how can a mobile operator with six million subscribers making 200+ decisions per minute apply the Nudge theory to effectively discover, learn and optimize how to engage with each customer to truly change their behaviors? Leveraging data-driven technologies such as pattern recognition, behavioral clustering, social graphing and predictive analytics, mobile operators are turning to data science and machine learning to advance the application of the Nudge theory — moving from a broad-brush approach to one of micro-targeting. So how do you determine “who” to Nudge? By understanding how individuals behave over time, we can use pattern recognition approaches to establish fingerprints of each customer and group according to behaviors they have in common — e.g., usage frequency and type, elasticity recharge cycle, social graph authority, etc. Then, by clustering people with similar fingerprints, discover what’s unique about certain groups relative to others, which indicates desirable and undesirable traits and causes that help describe how you should Nudge them. For example, we’re working with mobile operators focused on increasing the value of their prepaid customer base, with one objective being to increase the frequency with which a customer recharges. Through automated behavioral analysis, we can determine that customers exhibiting specific attributes — patterns of balance consumption, spend per day, inbound/outbound on- and off-network activity distribution, etc. — have the highest propensity of being influenced by a specific Nudge. Such highly individualized Nudges can yield double-digit percentage improvements in customer revenue and relative improvement in retention — the perpetual impetus driving marketers and mobile operators worldwide. Determining “when” to engage is equally important because the context of mobile users — their location, social interactions, activity — is constantly changing. It’s imperative to understand not only the customer’s previous and current contexts but also what they’re likely to do next. This is where the voluminous amount of mobile data becomes an advantage; enabling the discovery of behavioral patterns, sequences and trends tied to specific business objectives. For our defined group of prepaid customers, we can predict behavioral patterns. For instance, when a subscriber’s balance reaches a specified amount, they are likely to recharge within the next 24 hours, or when a customer misses the opportunity to rollover their current balance, there is a 71 percent higher probability of service cancellation within the next two recharge cycles. This understanding of what a customer will do next enables proactive Nudging — influencing a customer before a decision has been made versus reacting to how they have behaved. Although traditional Nudge theory is based on influencing the masses, mobile Nudging centers on personalization that can only be achieved at an individual level. By aligning the “who” and the “when” with the right parameters — time constraints, price point, offer value (if any) and the right contexts — we can personalize Nudges and determine “how” to market to each customer. In the case of our prepaid customer, we found that identifying and changing the right parameter — in this case, shortening the offer’s expiration period — not only results in a positive change for the next cycle, but it actually affects many cycles moving forward, generating significantly higher ARPU and lower churn. That’s what fuels the application of Nudge — the ability to positively impact business metrics. Every decision that a customer makes, whether to make a purchase, extend service, deepen engagement or recruit friends and family, is a Nudge opportunity and a chance to impact the bottom line. If mobile operators are applying Nudge to create positive and sustainable changes in customer behaviors that have a real impact on customer revenue and retention, it’s only a matter of time before businesses in other industries discover for themselves that with the help of Data Science, sometimes a Nudge can be more effective than a push or a shove. Dr. Olly Downs is SVP of Data Sciences for Globys, a big data analytics company that specializes in contextual marketing for mobile operators.